To say Bad Science is an interesting book would be an understatement. It's absolutely fascinating. But not only that it's also very enlightening. If you have ever read any articles by Ben Goldacre it's quite familiar ground. Homeopathy, the placebo effect, nutritionists, Gillian McKeith, medicine in the media and health scares are a few of the topics covered, in detail. What I really like about the book, which I didn't get from the articles, is the common themes running through the book and commentary on how some of the topics affect our culture and beliefs. Like I said, absolutely fascinating. So what about the enlightening stuff I mentioned? Well, it's apparent from reading Bad Science that science is often badly reported by the media. With that being the case, how can find out the truth for yourself? Ben Goldacre helps you out by giving an overview of what to look for in a scientific study; what practices help ensure a fair trial and the kind of tricks people use to give a study the slant they are looking for. He also mentions where you can find publicly available studies. The most useful place I think is the Cochrane Collaboration. This site publishes Cochrane Reviews which are systematic reviews of research. What is a systematic review? From the Cochrane site: "A systematic review is a high-level overview of primary research on a particular research question that tries to identify, select, synthesize and appraise all high quality research evidence relevant to that question in order to answer it". In other words they gather and collate high quality research which allows patterns to be observed that wouldn't be seen in individual small studies. Pretty useful if you ask me. 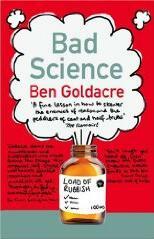 In summary, if you have any interest in science or have ever read any articles by Ben Goldacre before, I recommend this book. It's a very good read.